Got 99 Disney trip questions? I'm your expert. Let me answer one! Dear Monorails & Mickey Tales: How do I add a dining plan to a DVC rental reservation? The DVC owner has to do it. They also have to make your Magical Express reservations and register your room requests. If you paid an owner directly, you'll need to make the request (and pay them) directly so they can pay DVC to add the plan. If you booked through a DVC rental broker, just reach out with your request. They'll take your payment and send an email confirmation. In both cases you'll be able to see the dining plan on your My Disney Experience account once it's added. What would your answer be? Tell us! Dear Monorails & Mickey Tales: I always see Disney Photopass photographers but never use them because the cost seems too high. Recently I saw one photog take a pic with someone's phone. Will any of them do that? Yes, indeed! Photopass photographers will take a bunch of photos with their fancy cameras but will also take pics with your camera of choice if you ask nicely. Help! I'm headed to Disney in 2 weeks and forgot I told my daughter we'd eat at Belle's castle. Everything is booked now. Is there a way to get a reservation at Be Our Guest Restaurant 2 weeks out? There are a couple approaches you can take: First, check out Disboards.com to see if other Disneygoers mention canceling reservation times that you can then swoop in and claim. If that doesn't work, check right after midnight the night before you want to eat, when most dining reservations cancelations have to be made. For example, right now (12:10am) I can get a breakfast reservation for tomorrow morning. Dear Monorails & Mickey Tales: We just booked a last minute trip leaving in 3 days. Our magic bands will be waiting for us at our resort. I don't know if our Magical Express paperwork will arrive before we leave. What do I need to show the cast members to board the bus? All you really need is a reservation at a Disney resort. The Magic Band just speeds up the process a little. Without papers or a MagicBand, you'll need to check in at the Magical Express desk (it's very easy to find). Bring your ID. A reservation confirmation number is also helpful. They'll probably print out all the boarding passes you need for the bus, and you can proceed directly to the bus waiting area from there. Dear Monorails & Mickey Tales: I have a friend who's obsessed with Disney and pregnant with a baby due next year. What Disney related gifts can I give her? Thanks in advance for your help! Congrats to your friend! Exciting news. First I'd check her registry to see what Disney-related stuff you'll find there. If you can't find the right gift on her registry, it might be worth just asking her what Disney-related items she wants. The disneybaby.com website has been my favorite for shower gifts. It's basically a collection of Disney baby items that you then purchase on other sites like Amazon or Babies R Us. You can search by themes like your favorite character, too. I'm currently loving this Winnie the Pooh Bath Swaddler and this Small World board book. Generally I don't try to accrue miles when another option with a cash savings is available. In this case, if your credit card offers 1x points, you'd be paying $45 more for $15 worth of benefit. So I'd say stick to the cash savings - unless you need to meet minimum spending to get a bonus. And while we're on the topic, check out my tips for saving money on Disney resort stays. What’s a MagicBand, and is Disney tracking my Internet browsing history? Check back later today for your answer! Check back later today for your answers! 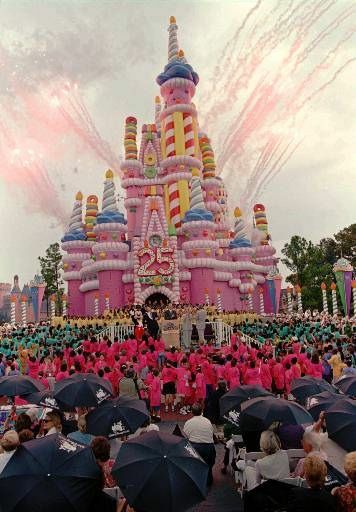 I've been going to Disney since 1997, when its executives made the bald-faced decision to dress Cinderella's Castle up like a birthday cake. I have a master's degree in creative writing. One day I tripped while approaching the ticket counter at Hollywood Studios. My Excel printouts spewed in all directions. The Disney cast member exclaimed, "Well somebody came prepared!" The genie had been let out of the bottle; my destiny to be a Disney planner revealed itself.